Tonight, big news shocked the hockey world, as the Buffalo Sabres finally dealt Thomas Vanek. He was dealt to the New York Islanders in exchange for Matt Moulson, a first round pick in 2014, and a second rounder in 2015. Islanders – They get a top scorer in the prime of his career. Vanek, 29, in his first 8 full seasons in the NHL has scored between 50-80 points per season, and led the Sabres to a couple of playoff races, with stellar offensive play. Up until now, he co-led the Sabres with 9 points in 13 games with Cody Hodgson, on a struggling team trying to find some kind of footing. The Isles are getting a very dangerous scorer that will be a great complement to John Tavares. 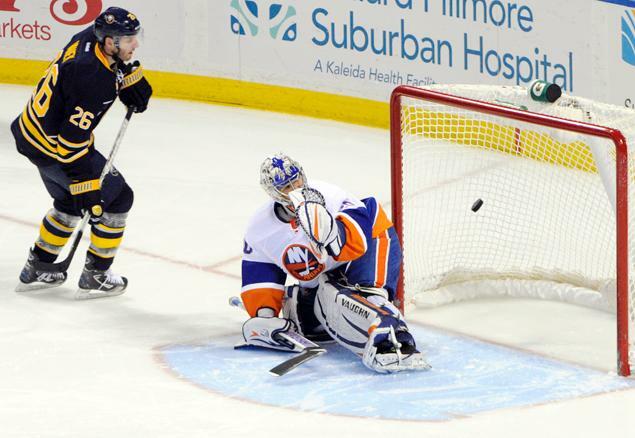 Sabres – Matt Moulson has been a very solid piece for the Islanders since they acquired him from the Los Angeles Kings. In the last 4 seasons, he missed 1 game total, and scoring 48-69 points per season, and at an increasing rate. At 29, he seems to be reaching his prime now. It does remain to be seen if he can carry an offense on his own, joining a struggling team trying to find an identity. The Sabres are getting a reliable scorer, and a durable player who will help the team for years to come. Buffalo also received 2 draft picks, a first and a second. Nothing to be said of those but speculation, but draft picks for a team rebuilding can prove invaluable. Conclusion and Verdict: Sabres win this deal. The Isles may seem like they are taking the best piece of this pie, but only short term. Vanek and Moulson almost cancel out the deal, and the Sabres picked up 2 potentially key picks that will go toward their future.